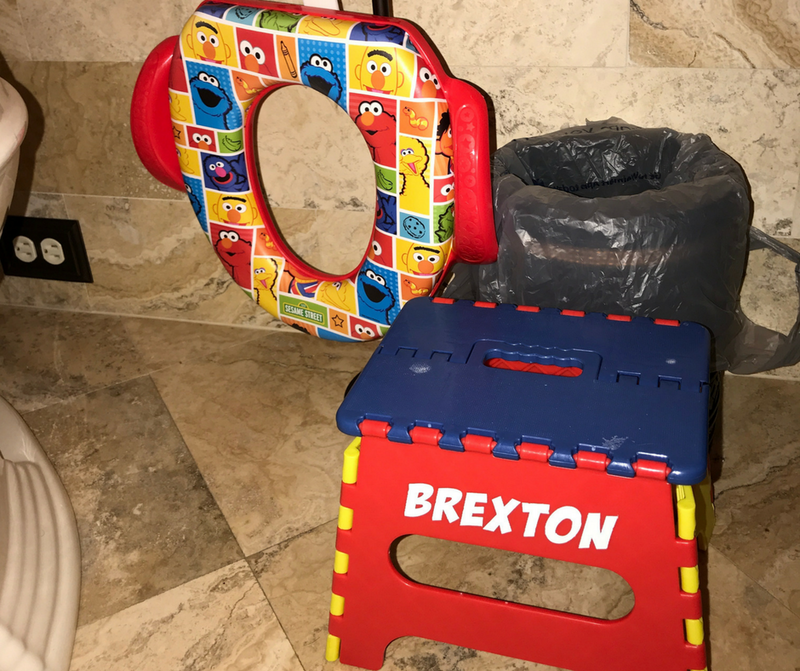 The thought of potty training Brexton honestly scared the crap out of me (no pun intended). Literally, I thought there would be crap everywhere, and I was scared. I knew I needed some good advice, so I took to social media to get a consensus of how other moms potty trained their kids. Let me say – the response was overwhelming and so many of the suggestions were great!! So I decided to write a blog and share the helpful tips I received for all of you that may be approaching this milestone in life or who are currently struggling with the process. Before I go into the details, I’m happy to report that Brexton stays dry through his nap and once through the night. He has only had two small accidents while at home in the very beginning of the process and is now asking to go to the bathroom while out in public. He refuses to wear underwear but enjoys going commando! We are still a work in progress, but I am very pleased with how it has gone so far! No meltdowns so far! First, I will tell you what I did with Brexton and then I will give you a few other tips that wonderful Moms shared with me that could be super helpful for you! When we began the process, I turned one bathroom in the house into Brexton’s own little oasis. In there I had a small potty, which he never actually used. I was super excited about that because it was one less thing I had to clean! I constantly urged him to use the big potty but had the little potty around just in case. MOMMY TIP: I was told if your child does use a small potty, line it with a coffee filter to make poops less messy to clean out of it. In the bathroom I also had three containers. One was filled with Skittles and M&Ms for after he went pee. The second was filled with “poop presents”. We went to the store and picked out race cars and he knew that he was only allowed to open the package once he went poop. The shopping trip was a fun way to get him excited about the potty training process! Finally, the third container had things for him to do – such as stickers and books while he was waiting to poop. He ended up never using these but I have heard many kids like them. In the first few days before we even began potty training I would just sit with him in the bathroom and read a potty training book to help introduce him to the space. Some of his favorites were Vegetables in Underwear and the Elmo Potty Training book with sounds. I really wanted to do the whole naked around the house for a week training but after Day 2, I realized that we were both going stir crazy in the house so that plan dropped quickly. (Although, I’m told if you are very disciplined and do actually stay home for 3-7 days, it works!) Instead, whenever we were home, I made sure that Brex was running around without any bottoms on, which he was very pleased with (typical boy!). Honestly, it was pretty easy. We would just constantly remind Brexton that he didn’t have a diaper on (especially when he was in pants) and after one accident, he pretty quickly began to tell us when he had to go. We would also make it super fun by running (or pretending to be dinosaurs or cars whatever he was feeling that day) to the bathroom, we would sing a little song when he was done and give him tons of praise when he did it. We were having a party and when he came out of the bathroom everyone clapped and cheered for him and he thought it was the greatest! At the suggestion of a friend, for the first little bit, we faced Brexton towards the tank when he peed. It was just easier at home for him to be able to grip the top of the seat and to watch himself pee. We would sometimes give him Cheerios or Fruit Loops to aim at. For pooping, we have a little insert that sits on the seat and he sits normal. Be aware, those little seats are perfect for poop but be sure he is sitting far back, and his shooter is aimed down or else he will pee all over it! I’m not going to lie, bribery works! Peeing was easy, and he of course loved getting one piece of candy each time, but those race cars sitting in a bin right next to the toilet, ready to tear open, really did the trick. For the first two weeks he would wait until we would put a diaper on him again for nap or bed to go poop. But as Kyle and I would look at all the cool cars in the poop present bin with him, Brexton couldn’t resist. We kept telling him over and over that as soon as he did it he would get a car so as he was sitting there trying and pushing for the first time he was literally grunting “I’m getting a car!!!!”. Also, once you run out of toys, just find ones they haven’t played with in a while and rewrap those. You can also be an A+ Mom like me and not have any wrapping paper so wrap them in foil! Once he got the hang of everything and wasn’t getting presents for doing his business (he got them for about two weeks), I moved him to pull ups when we would go out of the house. Everything has been working well so far. I still use pull ups for naps (even though he wakes up dry) and use diapers for bed, mostly because I don’t want to deal with changing the sheets because he has only woken up dry once. I think in the next few weeks though we are going to move to underwear when we go places and to nap and a pull up for at night and see how it goes. Honestly this probably isn’t the most effective method, but you know what… it was pretty easy. There weren’t any meltdowns, huge accidents or fighting, so I’ll take it! Here are all the tips that other Moms shared with me that could be helpful for you too! 1. Put food coloring in the potty to make it less scary. 2. 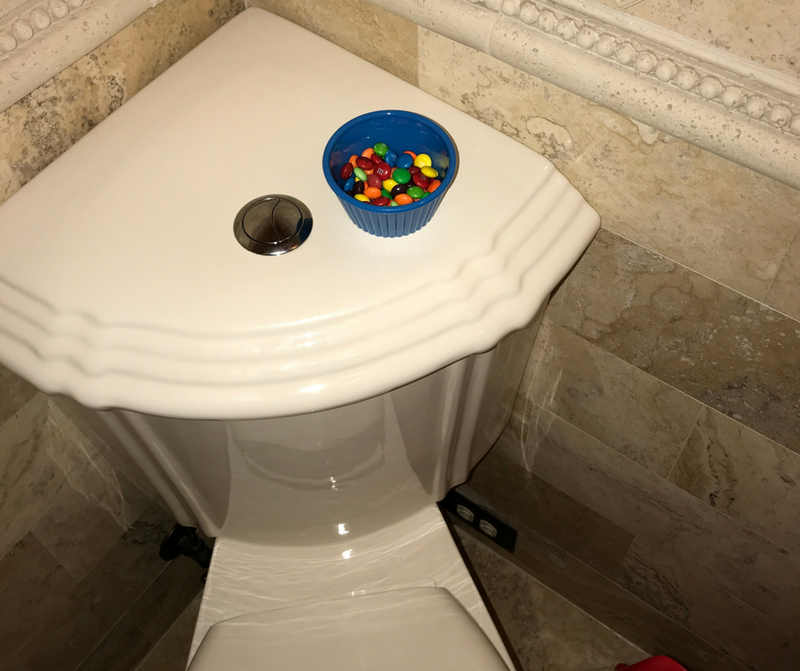 Put Cheerios, Goldfish, Fruit Loops or Marshmallows in the potty for boys to aim at. 3. 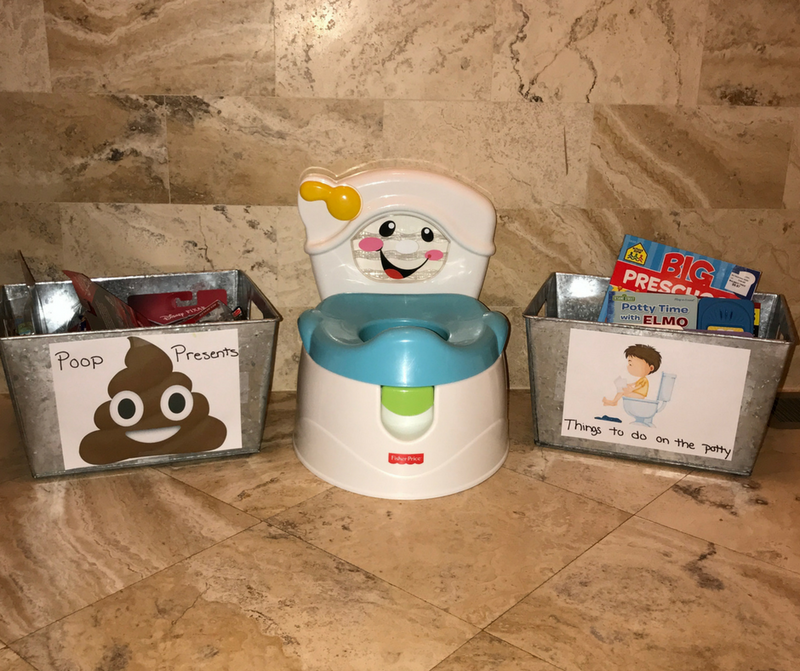 Have books on hand for your little one to have something to do while waiting for the poop to come out. 4. Buy a potty watch for your child to wear which has a little alarm and when it goes off that means it’s time to go try to go to the bathroom. 5. Lock yourself in the house for five days straight and leave him naked even during naps and bedtime. 6. Get a toilet seat that has a potty seat built into it. 7. Put a few dog pee pads down under the fitted sheet to protect the mattress from accidents. Also, you can put them in their car seat! 8. Keep wipes in the bathroom (I do this, toilet paper just doesn’t work as well to get all the poop out of a little one’s booty). 9. Refer to pull ups as version of underwear not as diapers, to avoid confusion. We simply call them pull ups and stand him up to put him in them so he doesn’t think they are a diaper. These are a few of my personal tips and more. I hope these will help all of you moms out there who may be struggling with the same thing. If you’ve already gone through potty training, share some of your tips that helped with your kid below!